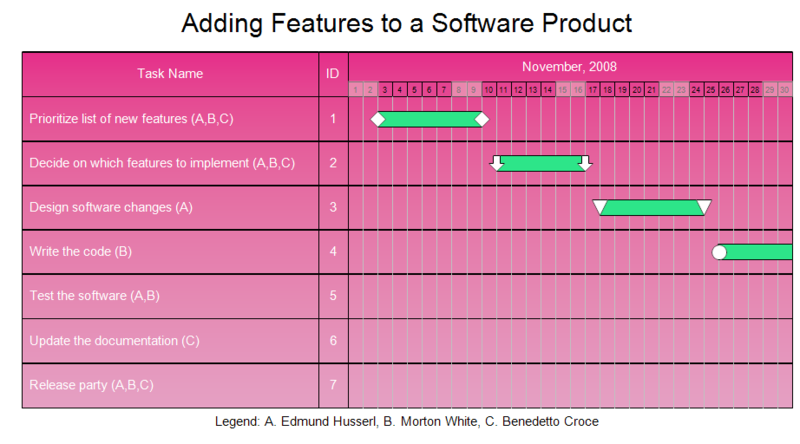 Description This Gantt chart is a schedule for adding features to an existing software product. It was generated by entering data and letting RFFlow draw the chart. The above diagram is page one of a two page chart. It includes a legend showing who is responsible for each task. This chart uses days as the unit of time. RFFlow also allows you to use hours, weeks, or months as the time unit. In this chart Saturdays and Sundays are grayed. Then follow the instructions in How to Draw a Gantt Chart. Follow each step and you can quickly create a Gantt chart. You can download the data file by clicking on software_features.txt. The data file is used by RFFlow to automatically generate the chart. Once the Gantt chart is generated in RFFlow, you can edit it like any other chart. You can edit the text, add descriptive text and arrows. change colors, etc.